Brown Dust launched in English worldwide on March 7, 2019 for Android and iOS. The game is developed by South Korean game developer Neowiz and while its only available officially on mobile, Brown Dust can be played on the PC using any of the popular Android emulators. Start by downloading an android emulator, installing it, and then looking up Brown Dust on the Google play app store then install it (I recommend just using Blue Stacks). I've personally downloaded and used several Android emulators over the years and my favorite one is Blue Stacks followed by Nox. Both are excellent but for the sake of this guide I recommend Blue Stacks simply because it's easier to use and gets updated more frequently. 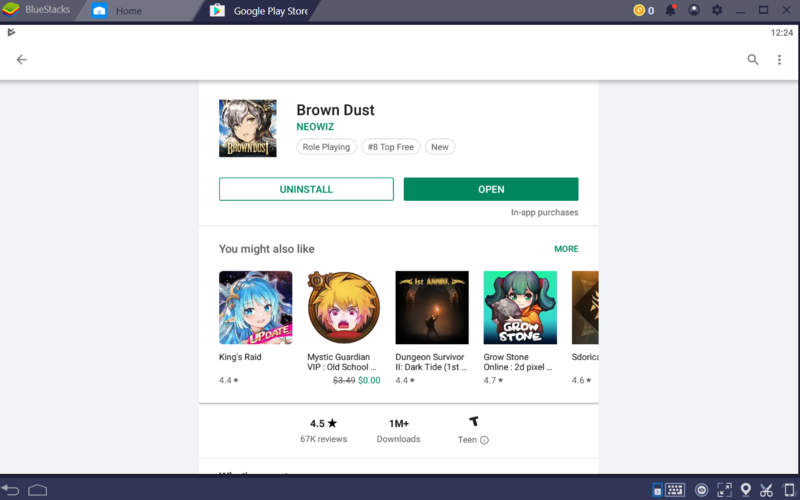 After downloading and launching Blue Stacks, simply open up the Google Play store and search for "Brown Dust". Like any other Android devices you'll be prompted to log in to a Google account before you can access the store. Log in with your regular Gmail account or just set up a new one if you prefer. I personally just log into the same Gmail account I use for all my apps so I can play them both on my PC and on my mobile device on the go. Besides the convenience of just being able to play Brown Dust on the PC, playing any mobile game through Black Stacks is great because players can customize their controls. I personally prefer mouse + keyboard to the normal touch controls of any mobile game and I love the fact that I can customize all my keybinds. Another obvious benefit to playing Brown Dust on the PC is the performance improvements as PCs are generally much more powerful than any mobile device. BlueStacks for example boasts 6x the power of any actual smartphone. Like other mobile games, there's a lot of down time in Brown Dust, so being able to just keep it open in a window on my PC while doing something else is super convenient. Brown Dust is a turn based RPG developed and published by the South Korean game studios Neowiz and AMFS Inc. Place units down strategically on a 6x3 grid and watch them fight enemies automatically. Unit placement, equipment, and upgrading troops is vital to victory. The game features gorgeous anime inspired art and Japanese voice acting. Been playing MMOs since I first got my hands on Ultima Online when I was 12 years old. Played so many games from Star Wars Galaxies to MapleStory to DAoC to World of Warcraft. Long time League of Legends player too! I'm also Known as "ReMo" and "Remotay"